Improve customer experience by engaging with your customers on their preferred channel of communication. As consumer technology has changed, so have expectations around how customers interact with companies. Customers expect the ability to interact over multiple channels (email, text, web chat, social media, calls, etc.) seamlessly. Contact centers need to deliver outstanding customer service through omnichannel technology that empowers their agents’ success. If you have a call center, then you know that customers like to use multiple channels to communicate with contact center agents – calls, text/SMS, email, web chat, web callback, and social media. This video provides an overview on how our Evolve Contact Suite can help you engage your customers on their preferred channel of communication while providing a seamless customer experience. It includes a demonstration of our Agent Client interactions i.e. call, chat & email. Agents can view all the interactions for a customer, their disposition, who handled them, the interaction type, etc. Move interactions across channels to reduce customer effort — place outbound calls when queues are busy and callers would prefer a callback. Automate and track outbound calls to customers that abandoned while waiting for an agent or were seeking website help outside of operational hours. How is a true omnichannel solution different than a multichannel solution? By definition, ‘multi’ means ‘many’ which is not so different from ‘omni’, which means ‘all’. This has led contact center solution providers to use these words interchangeably. However, functionality wise, multichannel and omnichannel communication are very different. In a multichannel contact center solution, businesses have the flexibility to choose from several channels of communications such as calls, text/SMS, web chat, web call back, fax, social media etc. However, these channels operate in silos. 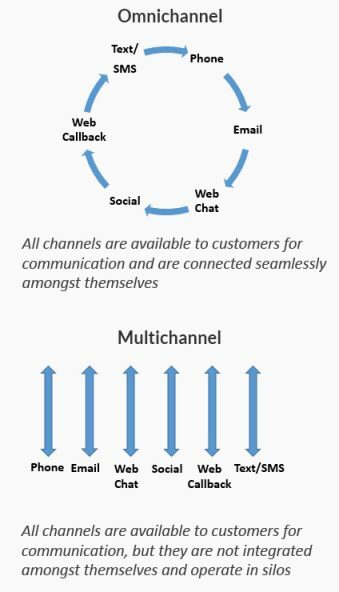 In an omnichannel contact center solution, businesses are offered the flexibility to pick their preferred channel of communication such as a multi-channel solution, but it offers an additional benefit of these channels being integrated i.e. all channels are available to the customer and are connected at the same time. Is your organization looking to deliver an omnichannel contact center? Click here to learn more about Evolve IP’s omnichannel contact center and differentiate your customer service. 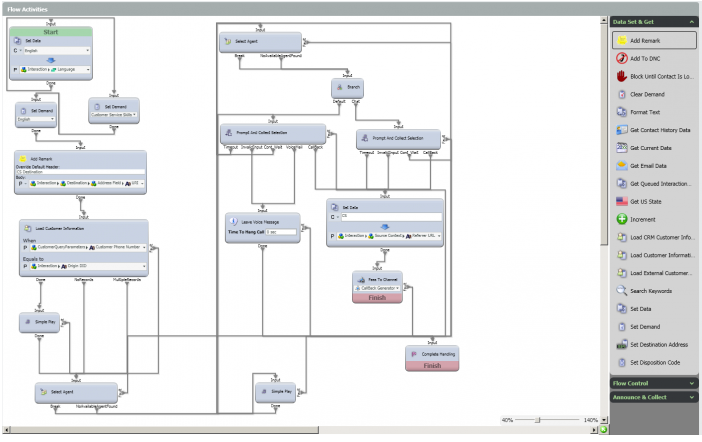 Visually build advanced flows that offer self-service applications, data-driven routing, and personalized customer interactions. A single set of business rules and logic for ALL interaction types. Telephony enables your CRM and business applications or leverage the built-in CRM to provide an integrated customer history across all communication channels.